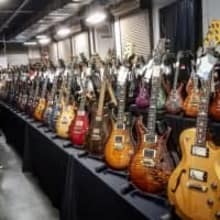 Located 30 minutes south of DC, we are an authorized dealer for Paul Reed Smith, ESP, Fender, Ibanez, Music Man, Martin, Breedlove, Bedell, Yamaha, Mesa Boogie, Marshall, ENGL, Orange, and so many other great brands. We pride ourselves in offering stellar customer service and some of the nicest guitars, amps, pedals, and accessories available today. We want to pair you with the perfect guitar that will meet all of your needs. I will ship with tracking. Mesa/Boogie products are ONLY available for US shipping, must be a US resident. Buyer receives full refund in their original payment method less any shipping costs and other associated fees charged by reverb to the seller. Special order items are nonrefundable.